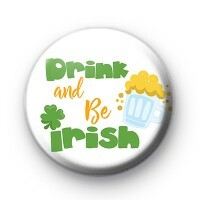 This white 1-inch Irish themed badge has the text 'Drink and be IRISH' written is a fun font along with an illustration of a glass of beer and a lucky green shamrock. Our Irish badges are also popular for St Patrick's Celebrations and add a touch of Irish fun to any occasion. We have a whole category for Irish and St Patrick's Day Badges so don't miss out on them.